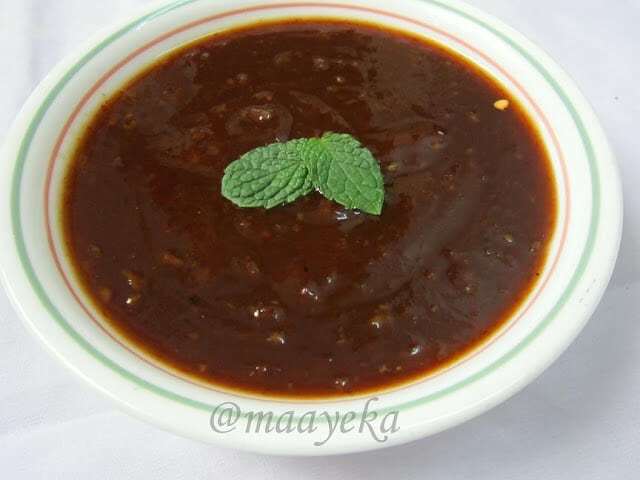 Khajoor Imli Ki chutney is a very popular chutney of North India .It is a must have to add on each chat and is served with snacks and pakoda’s. It is quite easy to make and have a good shelf life . Soak tamarind in 1 cup water for 1/2 hour . Remove the seeds from dates and tamarind. Pressure cook with 2 cups of water for 2 whistles. When cool down ,blend with a hand blender or mash well with your hand . Strain the pulp with a soup strainer. Add raisins and ginger,if you have fussy kids then add raisins and ginger in the strained pulp and blend again to make them into fine pieces. Give it a boil ,remove from fire. Keep at room temperature for a week then refrigerate it. 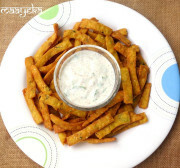 serving suggestions-serve as a dip with any snack ,chat or starter or as a side dish with stuffed paratha etc. How long can this chutney stay in fridge? yummy tangy n sweet chutney…. 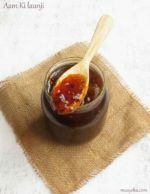 Love this sweet and tangy chutney. Lovely with dahi vada also. I was looking some recipe with dates- just in time, great for chaats! Awards waiting for you in my space. Do stop by to collect them. Delish! 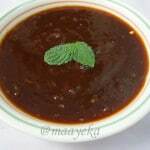 I usually do date tamarind chutney to go with biryani. Simply tasty and tangy looking chutney. 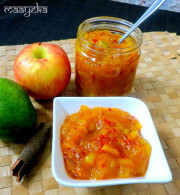 Delicious chutney,love it with samosas! 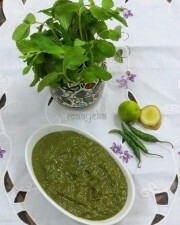 Tangy chutney,prefect for chaats too.